[Copyright 2002, From The Wilderness Publications, www.copvcia.com. 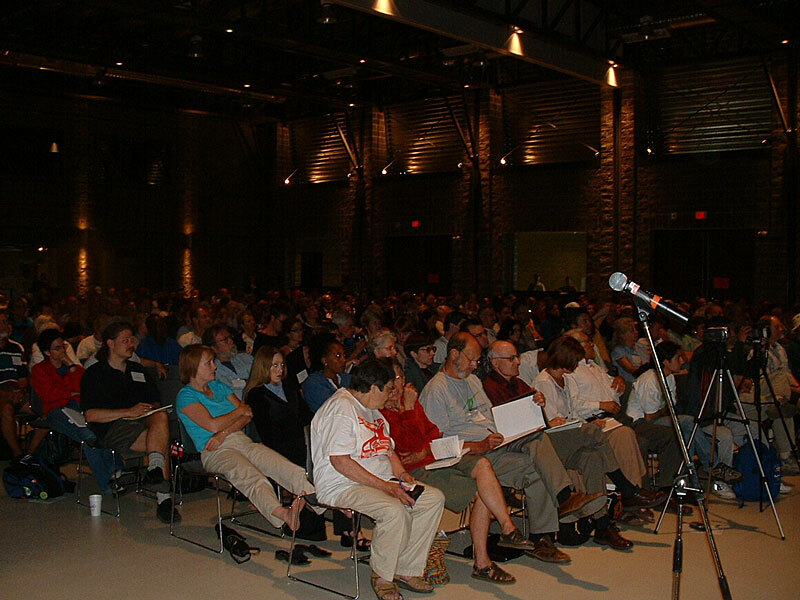 June 27, 2002, 16:00 PDT (FTW) -- An estimated crowd of 1,200 turned out on June 25 at the University of CalgaryпїЅs MacEwan Hall to hear FTW Publisher Mike Ruppert and University of Ottawa Professor Michel Chossudovsky present evidence of and a rationale for U.S. government complicity in last SeptemberпїЅs terrorist attacks. (See photos at www.fromthewilderness.com). 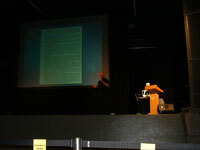 Their two-and-a-half-hour presentation, including documentary evidence, was greeted with a standing ovation. In a question and answer session after the lecture, not one audience member questioned that the Bush Administration needed the attacks in order to mobilize public support for a war to control Central Asian oil reserves and the cash from the Afghan opium trade. Traditionally, Afghanistan has been the worldпїЅs largest producer of opium. 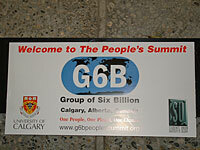 The G6B -- standing for a global population of six billion people whose interests need to be balanced against the corporate interests of the industrialized world -- was a three-day event sponsored by, among others, the government of Canada, Amnesty International and the University of Calgary. 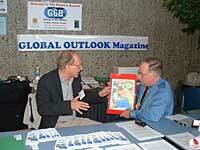 It brought delegates and activists together from 60 countries. 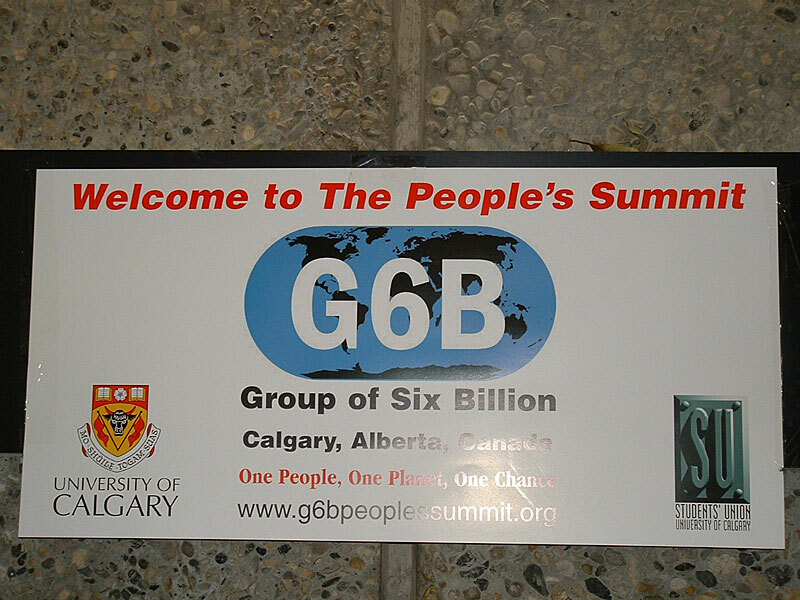 The counter summit was timed and located in Calgary, Alberta so as to juxtapose it with the G8 meeting in nearby Kananaskis of the worldпїЅs eight largest industrialized nations starting on June 26. The first joint presentation involving Ruppert and Chossudovsky, an economics professor, presented the strongest evidence to date that not only did the Bush Administration have complete foreknowledge of the attacks and allow them to happen, but also that the CIA had a direct hand in financing the attacks. Chossudovsky presented documentary evidence from ABC news, citing FBI sources, confirming a report that Gen. Mahmud Ahmad, then-chief of the Pakistani intelligence service (ISI), ordered for $100,000 to be wired to lead hijacker Mohammed Atta just weeks before the attacks. The new corroboration from U.S. media, using FBI sources, gave considerable weight to earlier press stories originating in India linking the ISI to 9-11. [These new revelations will be the subject of an upcoming story in FTW]. 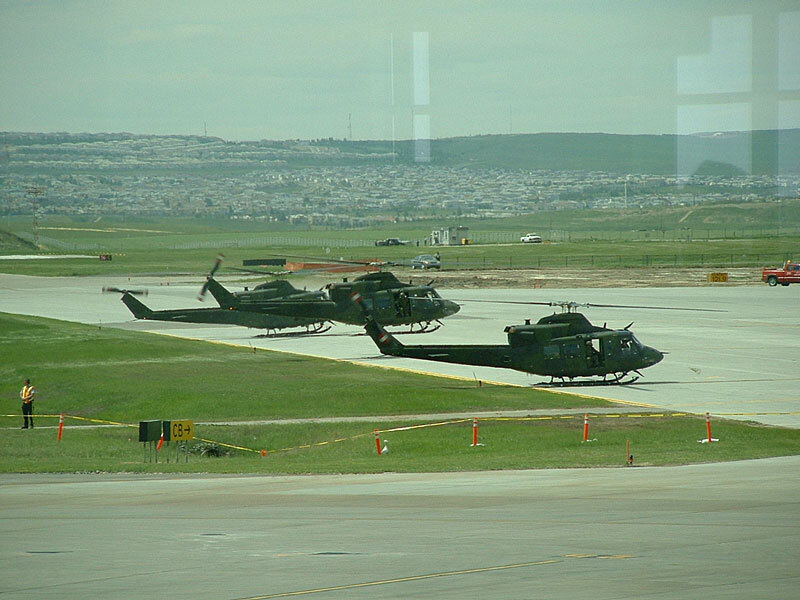 "Gen. Ahmad arrived in Washington on Sept. 4 and met with, among others, his good friend [CIA Director] George Tenet, [Deputy Secretary of State] Richard Armitage, [Sen.] Joe Biden, [D-Del.,] and the heads of the two intelligence committees," Chossudovsky said. "To me the issue of foreknowledge is a red herring. 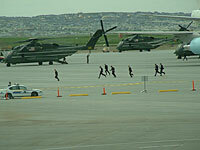 Osama bin Laden is and remains to this day a CIA asset. Even now his Al Qaeda operatives are working with the Kosovo Liberation Army who are U.S. allies and with U.S.-backed forces in Macedonia. Members of Al Qaeda have been protected as they moved into Kashmir where they are now fomenting conflict between India and Pakistan. "The evidence is becoming clearer every day that the U.S. government helped to plan and fund the Sept. 11 attacks," said Chossudovsky. In addition, Chossudovsky has uncovered what may be complicity on the part of the major media in hiding the smoking gun. Using transcripts from the Federal Records Service (FRS), Chossudovsky obtained the transcript of a question posed to National Security Adviser Condoleeza Rica at a May 16 press conference, in which she was asked if she had met with the "ISI chief" while he was in Washington. The CNN transcript of the event indicated that the words "ISI chief" were "inaudible" when, in fact, they were quite audible to the FRS. RiceпїЅs response was a troubled, "I have not seen that report, and he was certainly not meeting with me." Chossudovsky painted a broad picture of globalization pushing events toward a possible nuclear exchange between India and Pakistan by noting that one U.S. company with strong intelligence and military connections, MPRI of Vienna, Va., was acting as adviser to both governments. He also noted the strong links between CIA Director George Tenet and Deputy Secretary of State Armitage to the leaders of both countries. Chossudovsky also pointed out that President George W. Bush receives daily "personal" intelligence briefings from the CIA director -- a custom that has never previously been followed by any sitting president. Previously most CIA briefings have been delivered in written format. 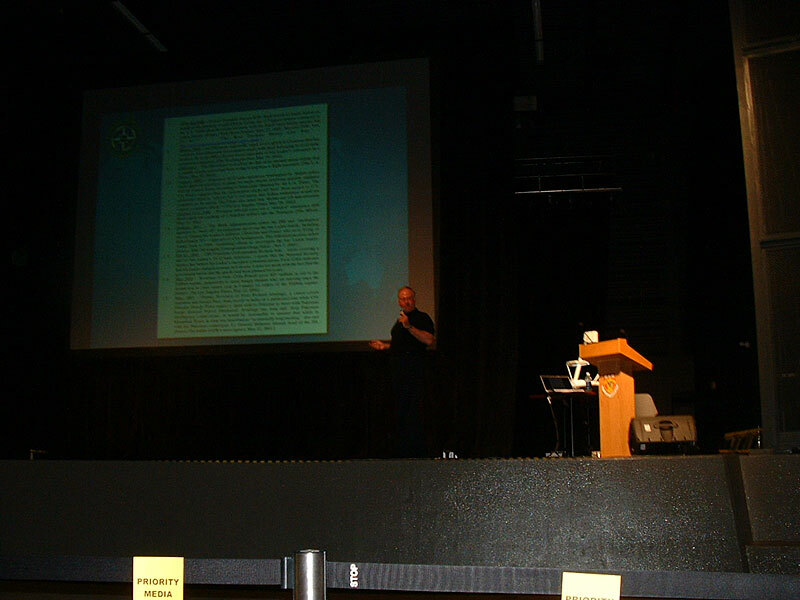 Ruppert, using new evidence of U.S. government foreknowledge disclosed by major media sources and through recent press conferences, established that by using only open source material, the U.S. government had warnings that multiple airliners, most likely from United and American airlines would be hijacked during the week of Sept. 9 and crashed into the twin towers. Using revelations of intelligence intercepts and a Pentagon drill responding to an attack from a hijacked airliner staged prior to Sept. 11, Ruppert established that the Bush AdministrationпїЅs position, which held it had no hint that aircraft would be used as weapons, was false. Pointing to last yearпїЅs G8 summit in Genoa, Italy, Ruppert noted that extensive precautions had been taken there (including anti-aircraft guns) to prevent just such an attack. A Los Angeles Times story disclosed that President Bush was the target of the suspected attacks in Genoa. "Bush ought to be having some interesting conversations with the leaders of Italy, Germany, France and Russia since it was their intelligence services who forwarded detailed advance warnings to the CIA throughout the summer of 2001," said Ruppert. 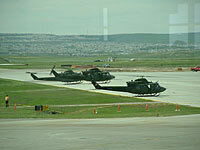 "And they referred specifically to suicide attacks with airliners." Ruppert also debunked the notions that the 9-11 attacks were caused by a lack of cooperation between agencies, and that great numbers of people would have had to be involved in the U.S. end of the operation. Citing a BBC TV report by Gregg Palast which showed an FBI report stating that the Bush Administration had ordered the FBI to curtail investigations into bin Laden relatives, Ruppert demonstrated that orders were coming from levels above FBI and CIA leadership. Additionally, referring to the recent memorandum from FBI Special Agent Colleen Rowley and a press conference given by FBI Special Agent Robert Wright, Ruppert popped the governmentпїЅs position that somehow the so-called intelligence "failures" of 9-11 were the result of negligence. "If you look at the text of RowleyпїЅs message and listen to what Wright said at his press conference, you hear and see words like, пїЅobstruct,пїЅ пїЅdeliberately thwart,пїЅ пїЅintimidate,пїЅ пїЅblock,пїЅ пїЅharass,пїЅ пїЅdishonest,пїЅ пїЅrewrite,пїЅ пїЅomit,пїЅ пїЅundermine,пїЅ пїЅsuppress,пїЅ пїЅpunish,пїЅ пїЅretaliateпїЅ and пїЅprevent.пїЅ These are not words describing negligence. These are words describing deliberate and willful actions. "And if you note from both the Rowley memo and apparently from the Wright press conference, it was only one supervisory special agent at FBI headquarters who did all of the deliberate work to stop investigations that could have prevented the attacks. And what did Rowley tell us? Right after Sept. 11 the agent who had blocked the investigations was promoted!" The $64,000 question remains unanswered: Was the agent in RowleyпїЅs case also involved in blocking WrightпїЅs Chicago-based investigations into money-laundering for terrorist groups, including Al Qaeda? 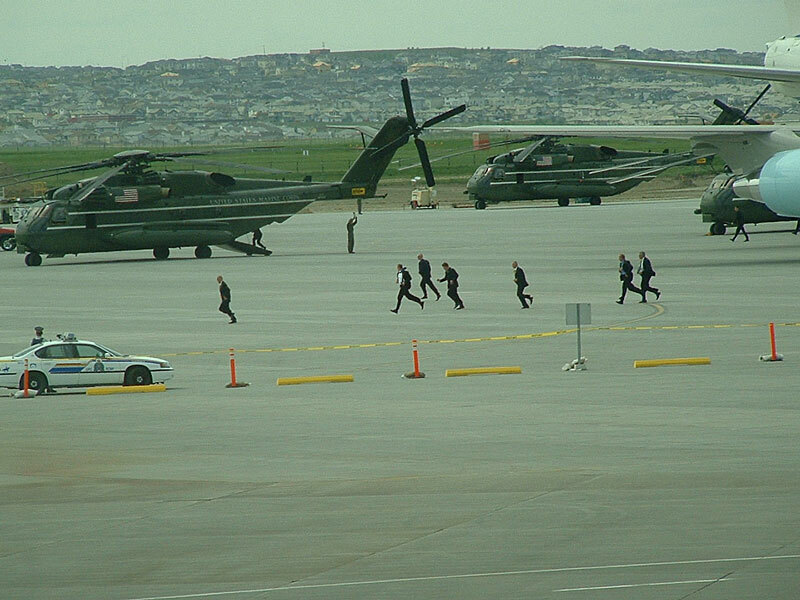 In any event, the Rowley memorandum proves that just a few officials in key positions could have carried out the 9-11 conspiracy successfully. 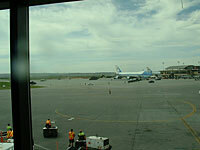 On entering Canada Ruppert was questioned first by Canadian Customs officials and then by immigration officers. Upon learning that Ruppert was a journalist and publisher of FTW the immigration officer typed RuppertпїЅs name into a computer and asked specifically if he was going near the G8 conference. 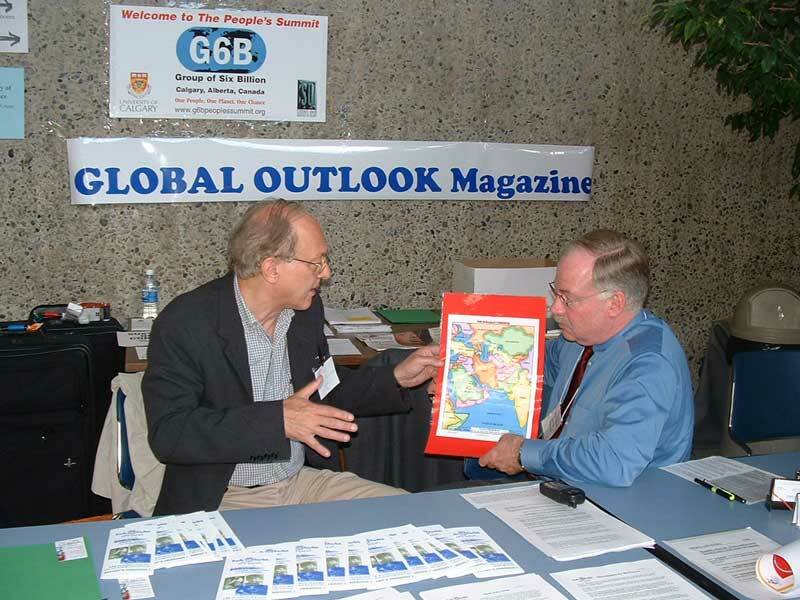 Ruppert stated that he was only planning on attending the G6B conference and had plans to return to Los Angeles on June 25. 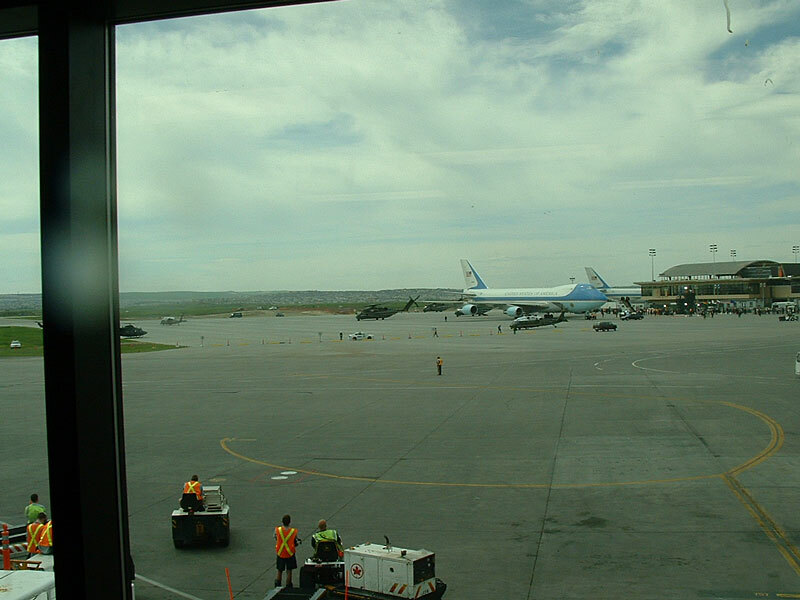 Nonetheless, the immigration officer stamped RuppertпїЅs passport with a visa dated to expire on June 26, requiring that he not be in the country when the conference began. This highly unusual practice was offensive to many Canadians who pointed out that there are no visa requirements between the two countries. 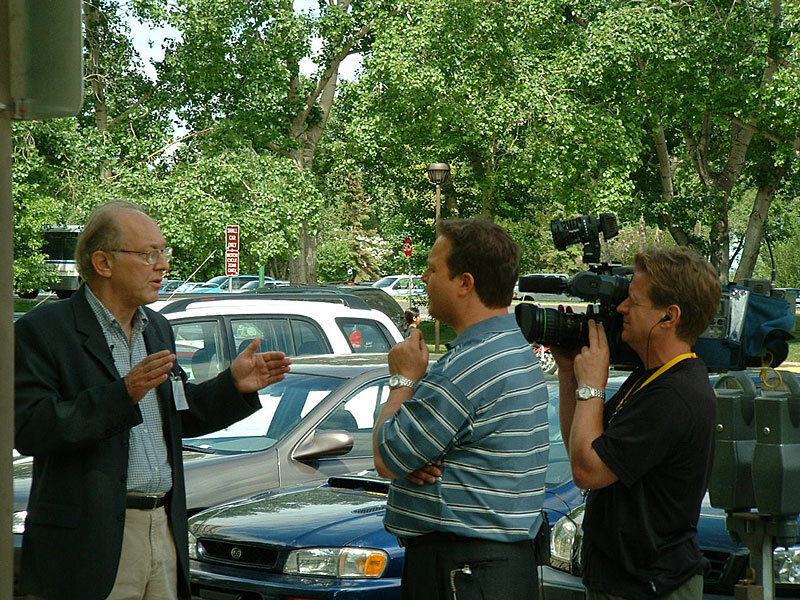 After the lecture, as he was hurrying to the airport, Ruppert was questioned by the local press who photographed his passport as evidence of the Canadian governmentпїЅs desire to censor coverage and public access to the conference. 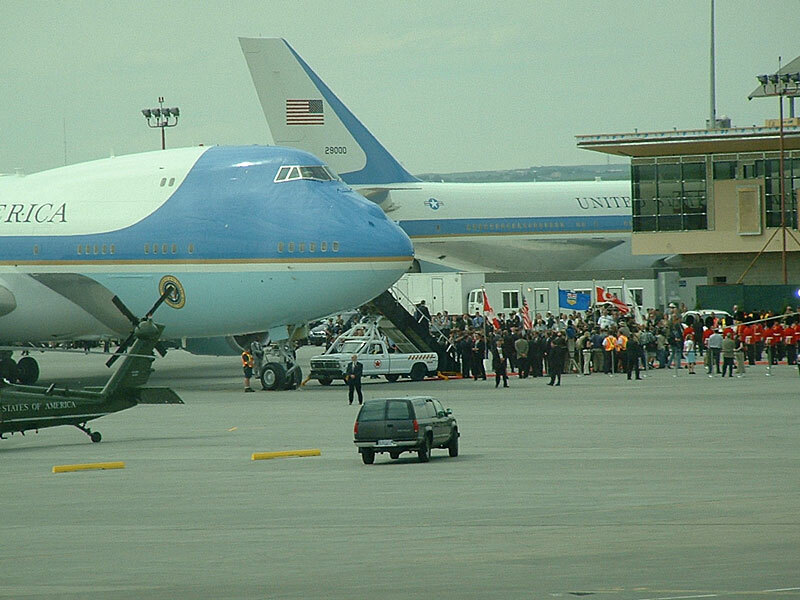 RuppertпїЅs departure coincided with the arrival of President Bush and two identical 747 aircraft painted with Air Force One markings. 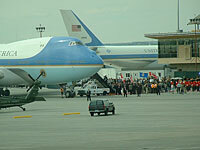 He was able to photograph the arrival of the president and a heavy deployment of support and security aircraft. RuppertпїЅs flight home was delayed by more than an hour. He returned safely to Los Angeles while his suitcase was forced to spend the night in San Francisco. 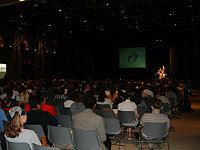 The Calgary lecture was RuppertпїЅs eighth stop in a month in his "Truth and Lies of 9-11" lecture series. He plans to spend the next six weeks working on new stories. 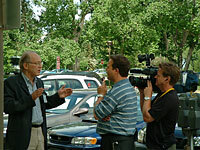 Chossudovsky Answers Questions From French Canadian T.V. "A Visa Expiration Date? In Canada? OK, I was leaving anyway."